One day as Barbara and I were having our morning coffee, I stood at the window looking across the driveway to see the trailer hitch barely hanging in its sleeve on the back of the van. It is that kind that slides into about a 2 inch square sleeve that has a pin that runs through it which is secured by a carter key. The day before, I had slid the hitch into its slot without pinning it, because I was just using it to get a ladder from off the top of the van. Then I forgot to pull it out and put it back into the van. It had ridden that way all day long slowly vibrating out in all my running around, including a 40 minute trip down the interstate. I was thankful it made it home, but it was just about ready to drop out. I pointed it out to Barbara, but was in my sock feet, and the outside pavement was wet with rain. Rather than put my boots on and take care of the matter right then, I thought, “Well, I am about ready to leave, I will just take care of that in a few minutes.” In a few minutes I was finished getting ready and I got in the van and took off. I thought about the trailer hitch after travelling about ten miles down the road. I pulled over on the interstate to find the trailer hitch gone. I retraced my route, but of course, I did not find it. Somebody had a “finders keepers” worth about $35. 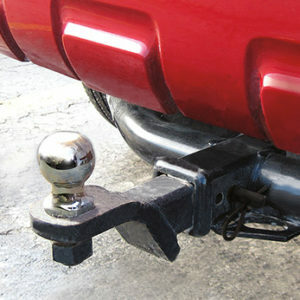 Because I failed to “git ‘er done” right then, I lost my trailer hitch. Being hitched up with Jesus and the power of the Holy Spirit is a good thing. First, Jesus is the source of eternal life, and without a vital faith in and commitment to him, you are gambling your eternal soul on the roulette table of life. At any moment you could suffer eternal loss and separation from the presence of God. That’s hell. Dealing with that is not something to put off another moment. You need to deal with that right now. Next, for this present life, God has many good things for us to employ and enjoy for our good through faith in his word and through the power of the Holy Spirit. To fail to pursue and apply these provisions that God has for us is to pull the trailer of life by ourselves without God’s direction and help. He wants to help us live in victory in every realm of life in a supernatural way. The longer we delay, the more we pay. “Git ‘er done” now to make sure your hitch is pinned in place and your trailer is loaded with the provisions God has for you. He only desires good things for you. Don’t lose your trailer hitch!